This year we monitored the original 28 C. hillii rosettes at Hegg Lake WMA to check the fitness and persistence of our original individuals/population. Presently, 10/28 rosettes remain, all as non-flowering basal rosettes. For each rosette, we measured the length of the longest axis and the corresponding perpendicular axis. No burns were conducted this year. This experiment assesses effects of fire on the fitness of Cirsium hillii (Hill’s thistle) plants at Hegg Lake WMA. 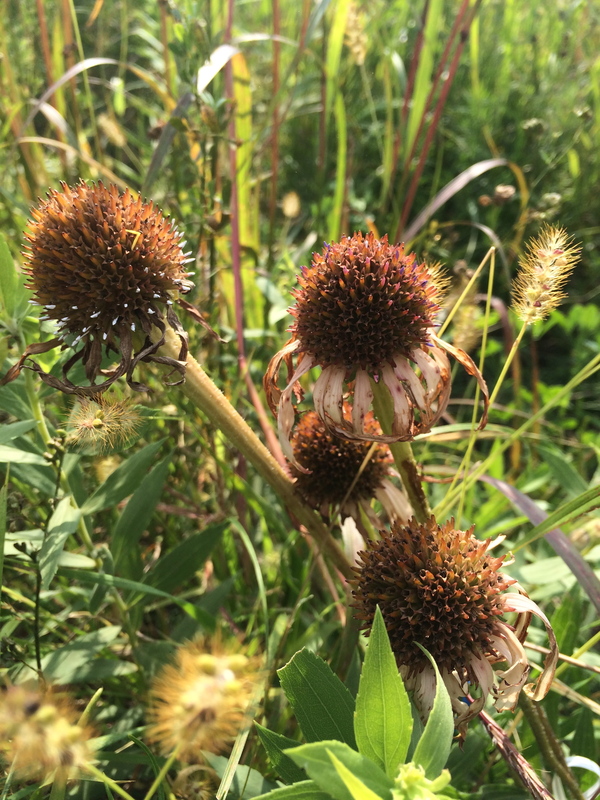 Like Echinacea, C. hillii inhabits dry prairies, but Hill’s thistle is listed as a Species of Special Concern in Minnesota and little is known about how it responds to fire. Burn and non-burn units were created prior to an experimental fall burn conducted by the Department of Natural Resources (DNR) in 2014. That year, we mapped 28 C. hillii rosettes (basal and flowering). The distribution of Cirsium hillii, a rare endemic to the Great Lakes region. Last year was also a non-burn year, although of rosettes found, there were three flowering rosettes. It’s challenging to determine cases of mortality with this species, since C. hillii is clonal, and it’s possible that each rosette is not a unique individual. In 2015, Abbey White found that there was only one or two individuals in our C. hillii “population!” We don’t know of any other C. hillii populations in Douglas County. We are possibly monitoring the last individual in the area. 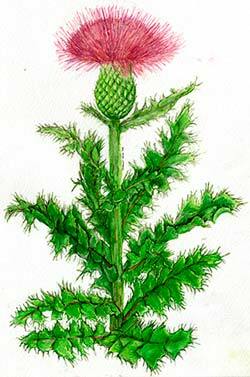 You can find out more about Cirsium hillii fire & fitness and read previous flog posts about it on the experiment background page. This experiment assesses effects of fire on the fitness of Cirsium hillii (Hill’s thistle) plants at Hegg Lake WMA. Like Echinacea, C. hillii inhabits dry prairies, but Hill’s thistle is listed as a Species of Special Concern in Minnesota and little is known about how it responds to fire. Burn and non-burn units were created prior to an experimental fall burn conducted by the DNR in 2014. That year, we mapped 28 C. hillii rosettes (basal and flowering). We revisited the locations this year, a non-burn year, and found three flowering rosettes. Several of the rosettes we found in previous years weren’t present this year. We weren’t sure if this was an indication of mortality since C. hillii is clonal, and it’s possible that each rosette is not a unique individual. Last year, Abbey White, a masters student in the Plant Biology and Conservation program at Northwestern, she analyzed the genetic diversity of tissue samples from each rosette. Based on a conservative delineation of genotypes, she found that there was only one individual in our C. hillii “population!” If she uses a more liberal approach, there are two individuals. We don’t know of any other C. hillii populations in Douglas County and are possibly monitoring the last individual in the area. Data collected: We measured the length of the longest axis of a basal rosette and the corresponding perpendicular axis. These data were recorded electronically in a memo and are backed up in Handspring. You can find more information about our experiment on how fire affects the fitness of Cirsium hillii and links to previous flog posts regarding this experiment at the background page for the experiment. After a slow start, Amy and I did demography at some of the recruitment plots near Hegg Lake and p2. The flowers in plots HE and HS, near P2, were doing especially well; we counted a total of 34 flowering plants combined in those two plots, with several having multiple heads, and were able to find nearly all of the plants there. We also returned to a stand of Cirsium hillii near p2 that we measure each year, and found that at least three of our study plants flowered recently. Whether they flowered this year or last year is not yet clear — the leaves definitely looked gray and crispy. Stuart made the long trek back from Chicago today and harvested some Astragalus canadensis for broadcasting and corralled an escaped goat. The highlight of today was finding a flowering (second day!) Echinacea near the Cirsium study area. We finished phenology in all of the remnants and plots several weeks ago, and have even harvested a good number of heads that are ready to drop their achenes. How this one is flowering so late in the season is a mystery — it may have to do with some recent mowing. We look forward to revisiting this plant to see if, by some miracles, it gets lucky and some of its styles shrivel. Flowering (second day!) Echinacea found today near P2. Outrageous! Amy and Chek look for Echinacea from the car. Cirsium hillii (Hill’s thistle), like Echinacea, is a native, self-incompatible, prairie species that grows in high, dry soils. However, Hill’s thistle is listed as a Species of Special Concern in Minnesota and little is known about how it responds to fire. We study effects of fire on the fitness of C. hillii plants at Hegg Lake WMA. Burn and non-burn units were designated prior to an experimental fall burn conducted by the DNR in 2014. That year, we mapped 28 C. hillii plants (basal and flowering) in those plots. Following the burn in summer 2015, there were two flowering C. hillii individuals. 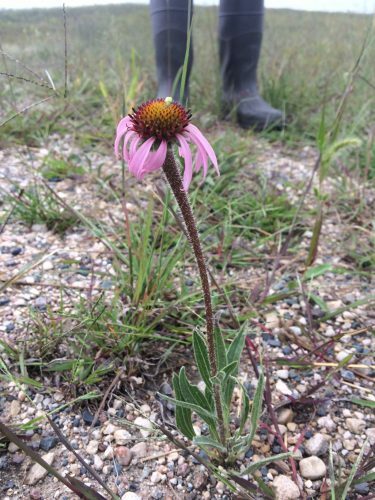 Team Echinacea assessed survival and collected tissue samples from plants for analysis by Abbey White, a MS student in Northwestern’s Plant Biology and Conservation Program. 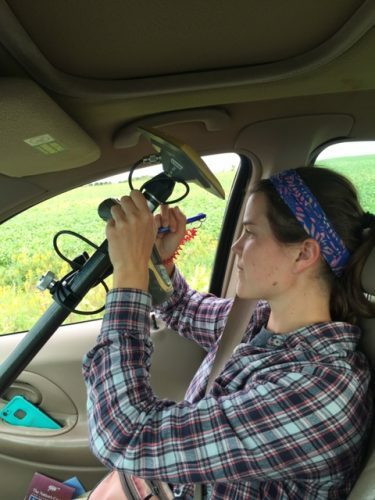 Abbey used microsatellite markers to describe patterns of genetic diversity across the Midwestern range of C. hillii and determine if inbreeding or clonal growth contribute to the low seed set observed in the region. So far she has seen evidence for a lot of clonal growth. This has a direct application to the restoration of C. hillii since the number of plants we see may not be representative of the number of genetic individuals in the population. We will revisit plants annual to assess their survival and reproduction. Today marked our third day without Stuart. But our arrival to a Stuart-less Hjelm house was made brighter by the appearance of a tiger salamander! (In Roxy’s absence, we’ve noticed quite a bounty of wildlife roaming the area.) Katherine, who has known since the age of 8 that the majestic and bafflingly cute creature is her favorite animal, was especially excited. After an extended photo op and cuddling session, the team finally managed to set the salamander back down and get on with the day’s work. We all agreed that he was an upgrade from Ricky. 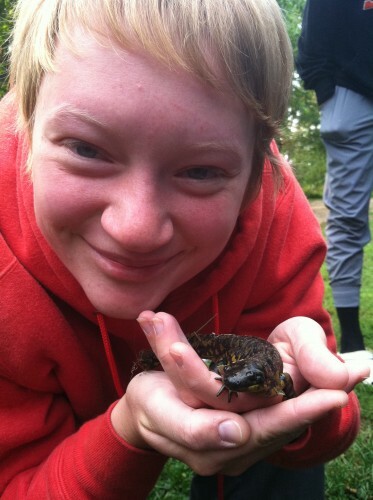 Katherine holds her first tiger salamander! Obvious soulmates. We spent most of the morning doing demography at the Rileys. Despite some grief and hardship caused by the abundance of mowed plants, we finished strong and well before lunch. Back at the Hjelm house we set to work cleaning and organizing, dealing with clutter that had been neglected for too long. Things got really exciting when Amy dug out the label maker. 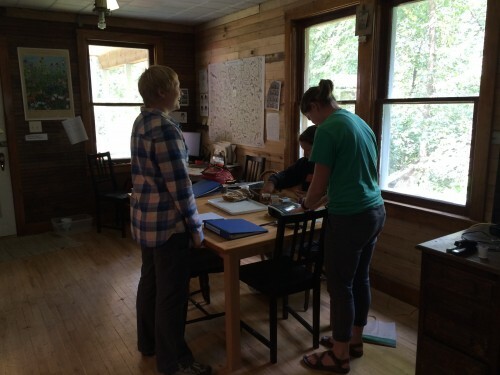 We spent lunch dreaming up big plans to label everything in the Hjelm house–in between fighting off the hornets. The Hjelm house is looking pretty good. After lunch, Will and I collected tissue samples from the Cirsium hillii at Hegg (that will be used to determine if the plants are distinct or actually one large plant) while Abby and Danny collected tissue from the angustifolia plants nearby the pallida restoration. Meanwhile, Katherine, Ali, and Amy stayed back to touch up the paint jobs on the heads for q3. Our work done at Hegg, we headed back to Hjelm and packed away the tissue samples to dry out. We printed labels for the samples, but unfortunately the label maker ran out of paper before we could get on with the rest of our big labeling plans. Oh well. We’ll have to continue to do our best navigating the house with its very average level of labeling. Heads for q3 wait in p1 to be harvested. As August draws to a close, we have been busy wrapping up phenology, making progress on demography, and harvesting Echinacea heads. While Claire, Elizabeth, and Stuart harvested heads at Hegg Lake, I mapped a patch of Echinacea angustifolia located a couple hundred meters west of P2. The patch centers around a small knoll ringed by poison ivy. I shot GPS points for 7 plants on the periphery of this Echinacea patch. Within the patch, I found 30 Echinacea flowering plants with a total of 37 heads. Most plants were located on the southwest slope of the knoll. Although I did not find any individuals on the north or east slopes, these hillsides should offer good Echinacea habitat. In preparation for the fall burn at Hegg Lake, we set up a small project to monitor a patch of Hill’s Thistle (Cirsium hilli). We identified, shot GPS points, and measured the basal rosette diameter for 28 individuals. After mapping and measuring the thistles, we split the patch into two plots and mowed burn breaks around our plots. The north plot will not be burned in the fall. Like Echinacea, C. hillii inhabits dry prairies but Hill’s thistle is somewhat rare and is listed as a Species of Special Concern in Minnesota. Fire is thought to be necessary for maintaining the native plant communities of dry prairies but little is known about C. hillii responds to fire.